Google+ changed the age requirements so that any Google Account user can join Google+. In most countries you need to be at least 13 years old to create a Google Account and join Google+, but there are 3 exceptions: Spain, South Korea and Netherlands. Until now, Google+ required to be at least 18 years old to "upgrade" your account. Google's VP Bradley Horowitz mentioned that there are a few tweaks and new default settings for teens. By default, only the people from teens' circles can trigger notifications and comment on their public posts. 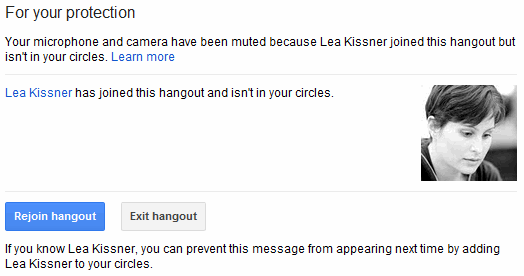 If someone outside a teen's circles joins a hangout, Google+ temporarily removes the teen from the hangout and gives him a chance to rejoin. Teens and young adults are the most active Internet users on the planet. And surprise, surprise: they're also human beings who enjoy spending time with friends and family. Put these two things together and it's clear that teens will increasingly connect online. Unfortunately, online sharing is still second-rate for this age group. In life, for instance, teens can share the right things with just the right people (like classmates, parents or close ties). Over time, the nuance and richness of selective sharing even promotes authenticity and accountability. Sadly, today's most popular online tools are rigid and brittle by comparison, so teens end up over-sharing with all of their so-called "friends." With Google+, we want to help teens build meaningful connections online. We also want to provide features that foster safety alongside self-expression. Today we're doing both, for everyone who's old enough for a Google Account. It's interesting that the updated form for creating a Google Account doesn't automatically create a profile and doesn't add the user to Google+ if he's not at least 18 years old. Any idea on how to change my birthday back to my actual now? The best switch Google have made ever. I doubt if FB would also copies Google+ policies in upcoming days. I hope that this means that K12 Apps domains get the chance to turn this on now, at least for faculty and admin. I hope they will stay at Facebook. At least most of them. But I don't agree with Facebook's ethics...though I'm probably 1 in 1000 for my age group on that. Google is certainly going to try to get more users - and try to make parents feel better with more safety controls for teens (Facebook has some) and "idiot-proofing" Google+, so I do think that Google+'s population will surge. @CZsWorld Google doesn't let you display or edit your birthday once entered. It's recorded in their file with no option for you, customer, to change it. I'm new to this Google+, and yeah its more like FB. I'm new to google+ too, i prefer to fb tbh... but cant see it being as big!! I don't know if Google+ can surpass facebook. But 1 thing is for sure. Google will do everything to make them number 1. Yay! It took G+ long enough though. I just hope that Google + will be better than Facebook. I dont like Facebook at all. Soooooo i see google plus is still a way behind facebook! !